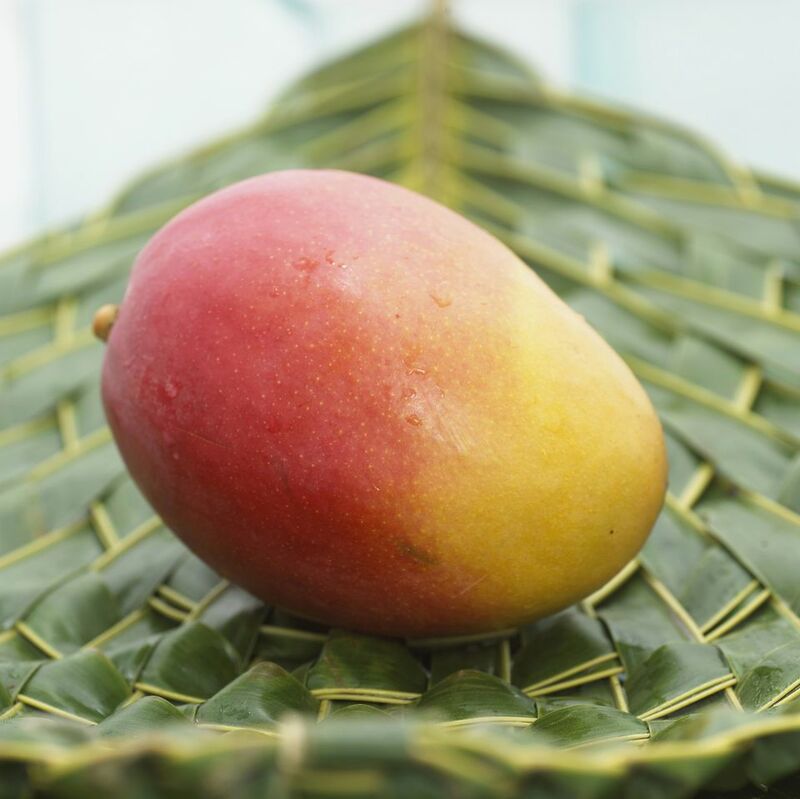 Unripe (but not green) mangoes will ripen in a few days when left on your counter. Refrigerate a ripe mango to make it last longer. In the middle of the mango is a large, flat stone. Holding the mango on its side, make an initial cut slightly off center (this way you will miss the stone). Here you can see the stone on the left. Holding the mango firmly, make a slice on the other side of the mango. You will now have three parts - two fleshy, plus the stone (don't throw the stone away yet!). Here you can either scoop out the flesh with a large spoon (if eating right away) or score the two fleshy parts into cubes. Cubes are great for fruit salads and other mango recipes. When scoring, cut through until your knife reaches the peel. Scoop out the mango cubes with a large spoon. Dig deeply (along with the inside of the peel) to get all the fruit you possibly can. Now take the stone and thinly cut away the peel with your knife (like pairing an apple). Then you can cut the remaining flesh off (or eat it right off the stone, as we do in our house!). Step 7: Enjoy Your Mango, or Use it for Thai Cooking! Enjoy your fresh mango as is, or use to add to fruit salads, desserts, or other Thai dishes. Fresh mango will keep (covered) in the refrigerator for several days; it can also be frozen. Note that there are many varieties of mangoes. The typical Mexican type (pictured here) is rounder and slightly stringy compared to Asian mangos. The flatter, kidney-shaped mango with yellow skin has less fiber and a smoother texture.